Wherever you go, you can bring along these products for family fun all day long. Whether it’s a picnic or birthday party game — or a just simple game of catch in the backyard, PlayN Wisconsin’s Fun To Go products will keep you and the kids entertained. You’ll be tossing, passing and catching everywhere you go with these portable, lightweight games, discs, balls and nets. Check out our Fun To Go products below and bring them along for your next outing. Ready to bring the fun along with you? 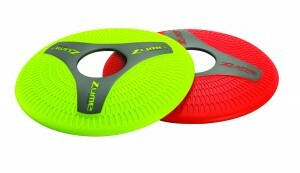 DIZK is a super-tough, soft-touch, great-grip flying disc. Unique design flies, floats, and flexes. A center hole creates more ways to catch. Ages 6+. Master your serve with TENNIZ, the portable, instant tennis match. Active game with smaller court and reduced speed. Ideal for building skills and having fun. Perfect for kids and beginners or recreational play. Lightweight and portable, TENNIZ features ultra-quick setup. 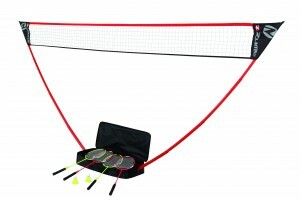 Includes 2 (21-inch) rackets, 2 balls, 12-foot net, and carrying case. For ages 8+. 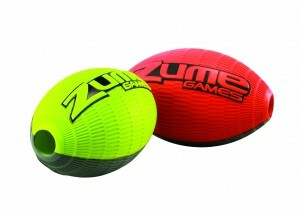 TOZZ is a super-tough, soft-touch, great-grip football. A center air tunnel creates spiral. Easy to launch. Easy to catch. Ages 6+. 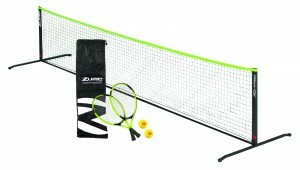 Play badminton anywhere and anytime with the Zume badminton set. Ideal for active family fun in the backyard, at the beach, on picnics or birthday parties – anywhere you want to get a quick match in. Lightweight and portable, badminton features ultra-quick setup. Includes 4 rackets (2 red, 2 green), 2 shuttlecocks (birdies), regulation height net and lightweight carrying case. For ages 8+. A fast-paced flying disc skill game offering non-stop offensive and defensive action, Bottle Battle requires competitors to knock down their opponents bottle/pole as the defensive team attempts to catch the disc and bottle before they hit the ground. Easy to set up, play and made for safe portable play, Bottle Battle is perfect for kids, beginners or recreational play. 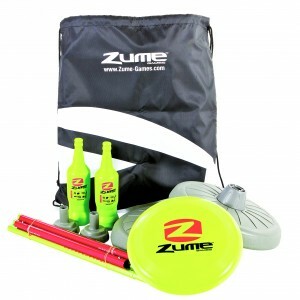 Includes 1 regulation 175 Disc, 2 target bottles, 2 multi-surface base and pole assemblies, and heavy-duty carrying case. Ideal for ages 6+. This soft touch foam ball is great for indoor and outdoor play! Played indoors, it won’t leave scuffs on the walls. And outdoors, its closed cell foam resists water. 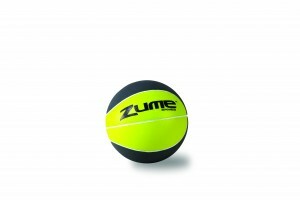 The Mini Ball’s unbelievable bounce and great grip help to make it popular with kids of all ages. Easy to catch and easy to shoot. 5” Diameter. Available in green, orange, and red. Passback Football is focused on helping athletes improve their game-day performance by developing the five key components of superior athleticism: speed, power, agility, reaction and quickness. Passback Training gives you the drills, programs, insight and information you need to work smarter, train harder and get better faster. 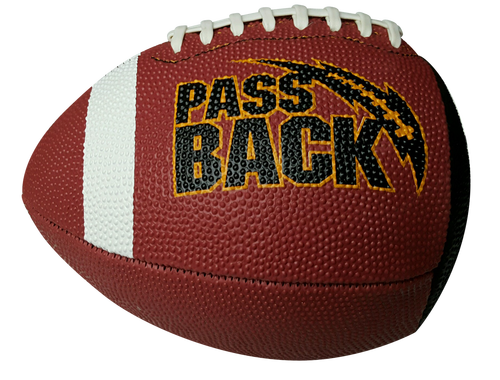 Today the Passback Football is now recognized as one of the leading “FootBall” Training Aids in the World. Now used in YOUTH, HIGH SCHOOLS, COLLEGE and NFL Football programs all over the World! Quarterbacks, receivers, lineman and defensive backs looking to take their games to new heights, the PassBack Football is football’s most innovative tool for improving hand-eye coordination, reaction time and strength.